As the French National Front barrels into the first round of local elections this weekend, the international media is sure to latch onto its anti-European (or Euroskeptical) rhetoric as a sign of the times. Indeed, given the raft of Euroskeptical parties like the UK Independence Party (UKIP), the Alternative for Germany, the True Finns, the Sweden Democrats, the Dutch Party of Freedom (PVV), and the Italian Northern League, it is easy to jump to the conclusion that Europeans have lost confidence in ‘Europe’ as a political project. One look at the travails that European leaders have faced responding to the macroeconomic crisis and it is not hard to see why that is the case. The problem with jumping to conclusions about support for European integration, however, is that doing so risks skipping over the importance of political mobilization. Europeans may be fearful of current conditions and they may face uncertain prospects but that does not necessarily translate into a loss of support for Europe unless someone convinces people that rejecting European integration is an appropriate response to manifest challenges. The ‘supply’ of anti-European rhetoric feeds the ‘demand’ in that respect. Hence wherever populists can focus their ire on other, more convenient political targets, Euroskepticism is less likely to manifest. Put another way, Euroskepticism is just anti-establishment or anti-elite politics in disquise. In making this case, let me start by setting the record straight. According to polling published by Eurobarometer last Autumn, positive attitudes toward the European Union are increasing both on aggregate across the EU 28 and in twenty-three member states, many of which – like the UK, France, Germany, and Italy – have prominent Euroskeptical political movements. Other measures of support collected in the same survey show a similar upward trend. Moreover, trust in European institutions is increasing much more quickly than faith in national governments or political institutions. Europeans remain concerned about unemployment in particular and economic conditions more generally. A large percentage worry that the worst is not yet passed in this crisis. And yet ‘Europe’ as political project seems to have recaptured some measure of popular affection. The same cannot be said for political elites in general. This is where I want to make the point about Euroskepticism being anti-establishment politics in disguise. The argument starts with a comparison of the Dutch and Belgian cases. 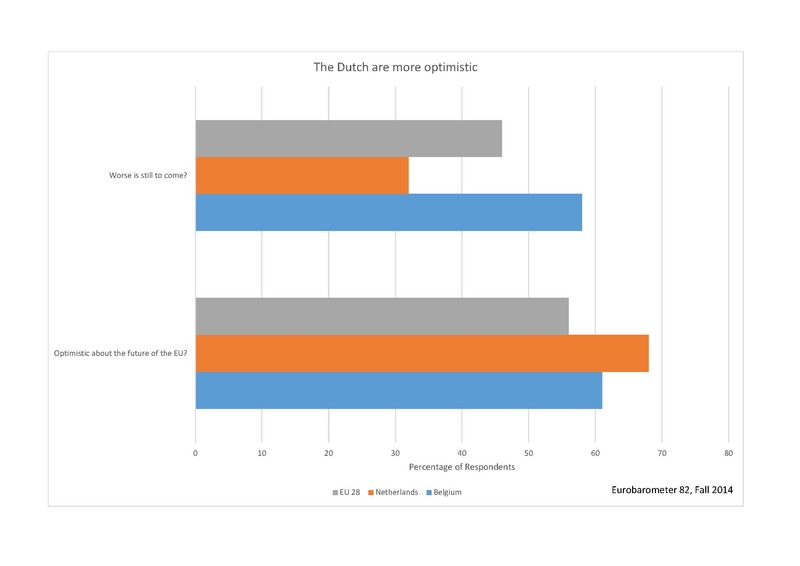 According to the same Eurobarometer data, the Dutch are more self-confident both with respect to the performance of their national economy and with an eye to household finances. They are wary of economic conditions but the vast majority believe that the worst has past. Meanwhile, the Belgians have a much grimmer perspective. They fear unemployment in the present and economic conditions looking to the future. Unlike the Dutch, the Belgians fear the worst is yet to come and they express concern about household finances. These attitudes are reflected in views on immigration both across EU member states and from the outside world. The Dutch are very positive about the free movement of peoples within Europe and surprisingly supportive of immigration from outside as well; the Belgians are more skeptical both about intra- and extra-European migration. Based on these kinds of concerns, it would seem likely that the Dutch are less prone to Euroskepticism than the Belgians. The reverse is actually the case. 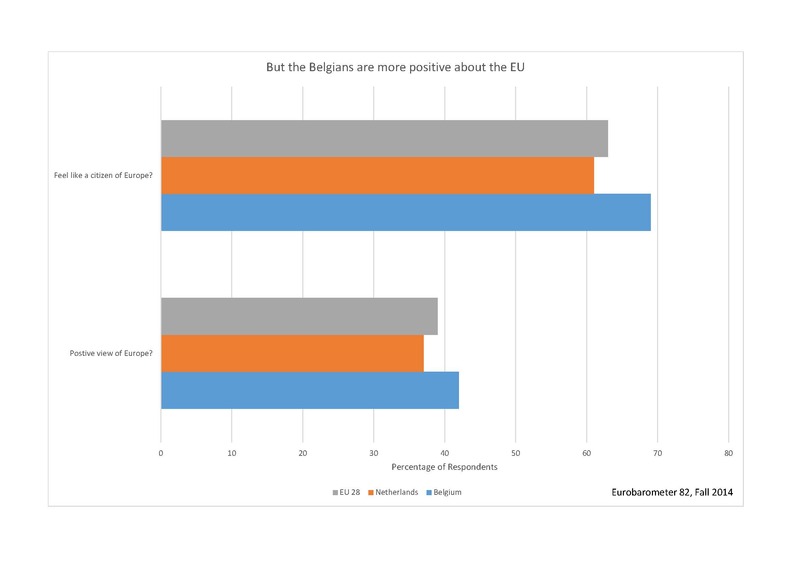 The Belgians express more confidence in Europe than the Dutch; they also express more support for European integration and a stronger attachment to European identity. These differences also show up in the political arena. Right now the Euroskeptical PVV is the most popular political party in the Netherlands; it is hard to find a similarly Euroskeptical movement in Belgium — even on the fringes of the political debate. The point I am trying to make here is not that the Dutch are more anti-establishment than the Belgians; rather it is that the Belgians reserve their ‘skepticism’ (disaffection, disgruntlement) for their own national elites and federal state. That would explain how the New Flemish Alliance (N-VA) was able to grow from a small separatist movement in the early 2000s to become the largest political party in Flanders and in the country across a succession of regional and national elections. The N-VA has flirted at times with Euroskeptical-sounding positions but never broke with the broader consensus about the merits of the European Union. Given the mobilization potential to be found attacking federal Belgium, a debate about Europe hardly seemed worth the effort. If anything, by embracing a moderately pro-European position, the N-VA could show that it is a party of government as well as opposition. The N-VA’s position on Europe is not unique. The Scottish Nationalists and Catalan separatists are similarly uninterested in starting a serious debate about European integration. The Italian Northern League is an exception; whenever it fails to rouse support with criticism of the government in Rome it tends to veer in a Euroskeptical direction. Indeed, this tendency has sharpened under the leadership of Matteo Salvini, who also appears interested in recasting the Northern League as more of a national movement. The Italian Five Star Movement shows a similar penchant but without the legacy of separatism. Fundamentally, however, these groups are more anti-elite than anti-European. Nurturing popular disaffection with Europe is just one of many instruments for mobilizing support behind their anti-establishment agenda. The preliminary conclusion (or hypothesis) to draw from this line of analysis is that – however well the French National Front does this weekend (and next) – Euroskepticism is less a spontaneous attitude than a product of political mobilization. If true, this should give us all reason to doubt that Euroskepticism is somehow driven entirely – or even principally – by structural factors like generational shifts, economic performance, or the mood of the times. Europe is being used by populists as an instrument to arouse fear and attack the establishment. This situation is not good for Europe but the failure of European integration is not to blame. Next Post → What Kind of Europe?